1995 Femco WBMC-100R2 5-Axis CNC Horizontal Boring Mill s/n BC2013 w/ Fanuc Series 15-M Controls, 1000 RPM, 50-Taper Spindle, Travels X=82”, Y=67.38”, 56 ¾” x 63” Table. Femco WBNC-100 5-Axis CNC Horizontal Boring Mill s/n 850122 w/ Fanuc System 11M Controls, 1000 RPM, 50-Taper Spindle, 44” x 40” Table. 1996 Kafo / Femco VMC-1685 CNC Vertical Machining Center s/n 030049 w/ Fanuc Series 0-M Controls, 30-Station ATC, BT-50 Taper Spindle, 4000 RPM, Hand Wheel, 33 ½” x 75” Table, Coolant. 1995 Femco VMC-1400 CNC Vertical Machining Center s/n 018138 w/ Fanuc Series 0-M Controls, 30-Station ATC, BT-50 Taper Spindle, 4000 RPM, Hand heel, Harbor Oil Cooler, 27” x 67” Table, Coolant. Mori Seiki MV-55/50 CNC Vertical Machining Center s/n 1092 w/ Fanuc system 10M Controls, 30-Station ATC, BT-50 Taper Spindle, NEW SPINDLE INSTALLED MAY 2015, 21 ½” x 55” Table, Coolant. 2009 Sharp / Proto Trak mdl. 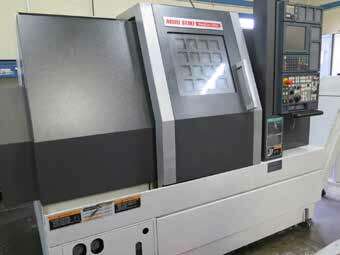 VH-25 2-Axis CNC Universal Mill s/n 70800774 w/ Proto Trak A.G.E.2 Controls, 60-4500 Dial Rpm on Vertical Head, 55-1180 RPM on Horizontal, Kurt Power Draw Bar, 40-Taper Vertical and Horizontal Spindles, Chrome Box Ways, 10” x 56” Table. 2004 Sharp / Proto Trak mdl. VH-25 2-Axis CNC Universal Mill s/n 30800177 w/ Proto Trak SM Controls, 60-4500 Dial Rpm on Vertical Head, 55-1180 RPM on Horizontal, Kurt Power Draw Bar, 40-Taper Vertical and Horizontal Spindles, Chrome Box Ways, 10” x 56” Table. Bridgeport / Proto Trak 2-Axis CNC Vertical Mill w/ Proto Trak Plus Controls, 2Hp Motor, 60-4200 Dial RPM, Chrome Ways, 9” x 42” Table. Steady and Follow Rests, Aloris Tool Post, 5C Collet Closer, 12 ½” 3-Jaw Chuck, 14” 4-Jaw Chuck, Coolant. 5C Collet Closer, 8” 3-Jaw Chuck, 10” 4-Jaw Chuck. HEM Saw mdl. 1000AH 13” Automatic Horizontal Band Saw s/n 203784VB w/ HEM Controls, Automatic Clamping and Feeds, Conveyor, Coolant. Marvel Series 8 Mark I 18” Vertical Miter Band Saw s/n 821491 w/ Marvel Controls, Miters @ +- 45 Degrees, Manual Clamping. Better Engineering mdl. SS300LXP Rotary Heated Parts Washer s/n 9443 w/ 36” Basket, Pumps, Heater, Blower, Skimmer. Kaeser SK18 15Hp Rotary Air Compressor s/n 185429 w/ 68CFM @ 110PSIG. Kaeser SM11 10Hp Rotary Air Compressor s/n 0115935 w/ 42CFM @ 110PSIG. 2013 Kaeser TCH22 Refrigerated Air Dryer s/n 1121. Econo-Line Dry Blast Cabinet w/ Dust Collector. Boyar Schultz Challenger H612 6” x 12” Surface Grinder s/n 22797 w/ Ceramax 6” x 12” Magnetic Chuck. Varian Auto-Test 948 Leak Rate Tester. Dayton 14” Pedestal Drill Press. Rotab mdl. 24 24” Motorized Compound Rotary Table. Bridgeport 90 Degree Milling Head. Collet Chucks and Flex Collets. Insert Milling, Drilling, Turning and Boring Tooling. (5)Huot Drill, Tap and Endmill Cabinets. Drills, Taps, Reamers, Endmills, Broaches and Heli-Coils. MicroVu mdl. H-14 14” Optical Comparator w/ MicroVu Q16 rogrammable DRO, Surface and Profile Illumination, 5” x 18” Table. Zeiss WMM850 CMM Machine s/n 70477 (NEEDS WORK). Mitutoyo 18” Height Master w/ 6” Riser. (3)Mitutoyo 24” Digital Height Gaes. Meyer Pin Gage Sets .011-.750”. (3)24” x 36” x 4” Granite Surface Plates w/ Stands. 18” x 24” x 3” Granite Surface Plate. 2007 GMC W4500 20’ Box Truck Lisc# 8F96464 w/ 5.2L Diesel Engine, Automatic Trans, AC, 76,860 Miles, VIN# J8DC4B16477005735. 2003 Ford Windstar Van Lisc# 7G78595 w/ Gas Engine, Automatic Trans, AC, VIN# 2FTZA54413BB18639. Dayton 1 Ton Hydraulic Hoist. Pallet Racking, Shelving, Shop Benches.